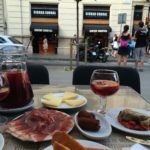 The food is excellent, the wine is inexpensive, nice beaches are just a train ride away and it’s an easy city to get around but I’ve had a hard time understanding why Barcelona is a favorite city of so many people I adore. I just couldn’t find the soul of the city. Yes I know that’s why there’s chocolate and vanilla. 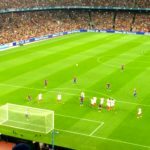 I was fortunate to have arrived on a day when FC Barcelona was playing. Not that I’m a huge sports fan but I always seek out a local game in any place I visit. It’s a great way to meet the people and experience their sports culture. (The fans didn’t sing as much as I anticipated) The game I attended started at 11pm, determined to make it a nap was a priority. 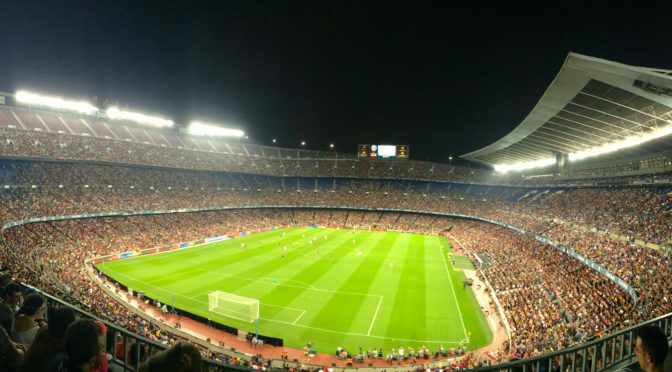 FC Barcelona is owned and operated by their supporters. The club is worth $3.58 billion, making it the 3rd most valuable sports team in the world according to Forbes. The Dallas Cowboys and Real Madrid rank 1st and 2nd. The night we attended the game Barça was playing Sevilla, a city I had previously spent some time in. 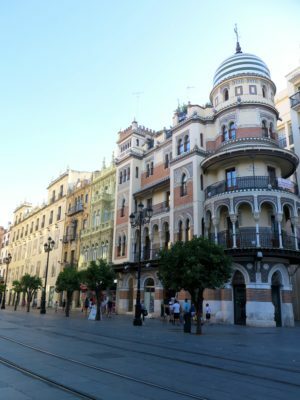 The city of Sevilla, like their football team, was smaller and slower than Barcelona. These were reasons I preferred it and secretly rooted for Sevilla, not that it helped! Some of you may think my bias has to do with seeing my nephew who lives in Sevilla, yes that was a huge bonus but nonetheless I enjoyed Sevilla much more than Barcelona. It is smaller and I felt like I was in an authentic spanish town and not a big international city. 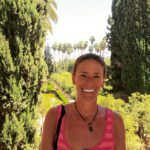 I loved getting lost in the narrow alleys of the old town and the gardens at Alcazar Palace were impressive. 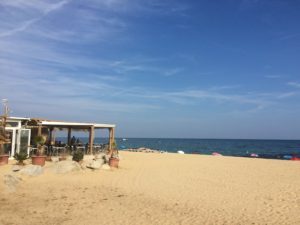 In Barcelona I really enjoyed the Picasso Museum, the Gaudi buildings were cool, the beach was perfect and I explored the city with a friend but what can I say? I like chocolate and Sevilla more than Barcelona. 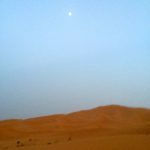 The moon was big & bright which is usually a good thing unless you take a two-hour camel ride into the Sahara Desert with the goal of seeing the stars. Getting to the camel transport was a chore in itself. 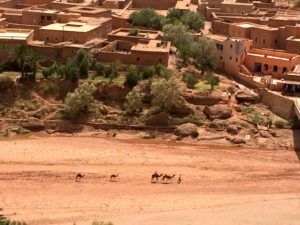 A full day of driving that included a couple of interesting stops at Kasbah of Ait Ben Haddou and the Todra gourde and few not so interesting. Being tourists of course we were detoured into places where we listened to the hard sell to buy “original” Moroccan goods. The first night we spent at a hotel that might have seen better days. 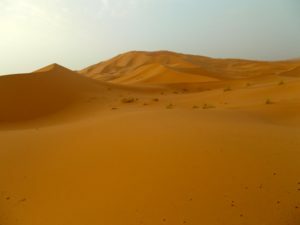 The twelve-hour trip was really all about the finale we envisioned; Sleeping under the stars in the Sahara Desert. 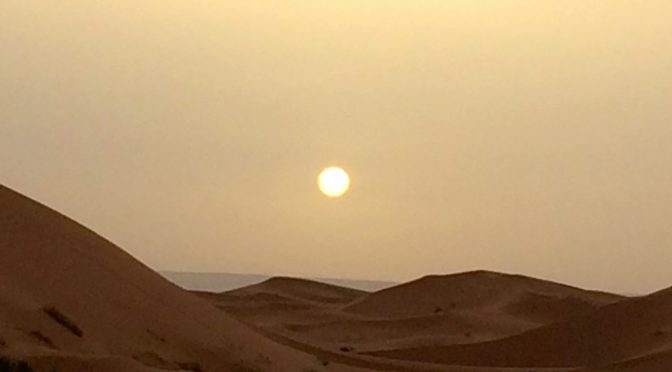 We arrived in the desert before the sun set but at a time when the moon was also visible. Our hopeful view of the galaxy got realistically smaller. At camp the food was served in big bowls and everyone received a fork. That’s it just one fork, no plate no drinks nothing but veggies, rice, chicken and a fork for all to dig and re-dig into. 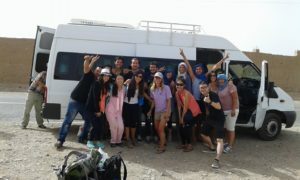 Did I mention the trip was an average of $80 for 3 days, I say average because here bargaining skills determine prices. 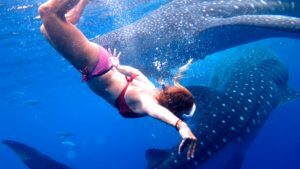 What could have been the biggest disappointment of my summer trip turned into one of my fondest memories. The people in my group who were a tad bit younger than me, ok yes a lot younger, but such a spectacular collection of travelers. They were from Mexico, Italy, Morocco, America, Germany and China. This group was talented (they really could jam on the local drums) intelligent, kind and so much fun. No stars? 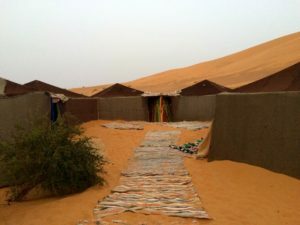 No problem there was a 460 meter (1509.19 feet or 94 stories) sand dune next to the camp. We clawed and climbed our way to the top where the whipping wind made the sand feel like light electric shocks to any exposed body part. 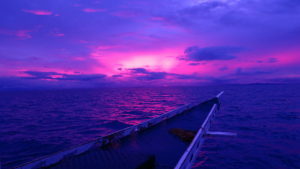 The view was stupendous and the night was magnificent. The Berber tent, where the blankets I assure you haven’t been washed in months, was extremely hot so we decided to nap under the moon. Eventually the moon finally set, allowing us a few hours to see the Milky Way. I saw at least 1 shooting star and I made a wish on behalf of a friend. The wish I made reminded me of how lucky we all were to have the physical and financial means to be in the middle of nowhere doing what we loved most, traveling. 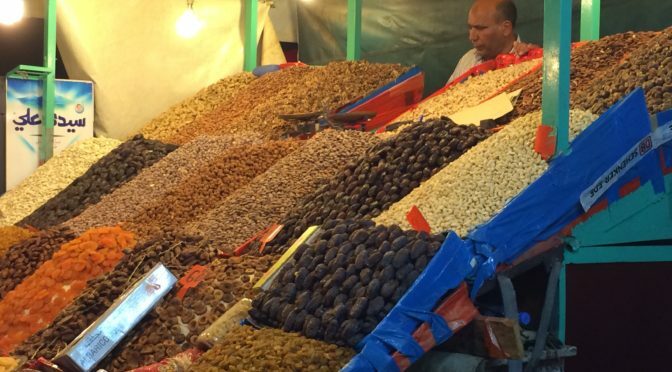 Within minutes of stepping foot in the Medina the sites, sounds and smells of Marrakech engulfs you. It was late at night when the taxi driver dropped me off in front of the square. He left me as close to my riad as he could get to in a car. 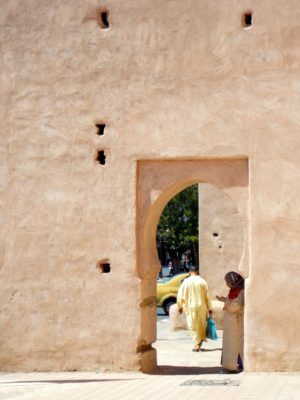 A riad is a traditional Moroccan house build around a central courtyard many are hotels and hostels. There I stood clueless with my pack on my back and my smaller backpack in my hands. On the fringe of the square that I needed to enter I mentally paused for a moment to adjust to my surroundings. I noticed the bright lights and smoke in the distance and the crowd, oh the crowd! Just imagine being at a concert of a popular band, it’s general admission and you’re 4 rows of people back from the stage and now it’s your turn for the beer run and you have to go and then get yourself back. Ok you get what I was dealing with without the beer of course! Thankfully I had a landmark, Café de France, that I needed to find but naturally I couldn’t see anything past all the people. As I dodged snake charmers, Henna tattoo artists and men with leashed monkeys I looked for tourists to stop and ask the way. I had already been warned not to get directions from a local unless I wanted to pay. It didn’t take me long to learn that everything and I do mean everything comes with a price in this city. Luckily for me it was my kind of crazy. I loved walking into such chaos. 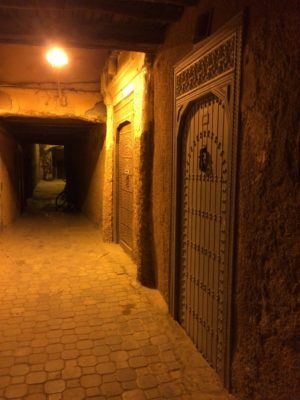 I found my landmark and continued with serious navigational doubts as I went through Moroccan arches that led to cool narrow and quiet alleyways. It was late and I was alone but for some reason I felt safe. I finally found the Riad only to be told the air-conditioner was broken and I had to go to another one. At the time I wasn’t too pleased but the minute I walked into the new place I felt it was exactly where I should be. It was quieter with décor that was comfortable and cohesive, its character didn’t appear forced. The guy who runs the place, Ibrahim, instantly made me feel at home. 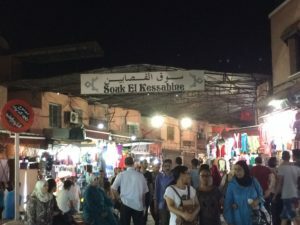 This would become my sanctuary when I needed a break from the souks, salesmen and scams artists over the next few days. My favorite encounter was a man who spoke perfect English and claimed he lived in New York for a few months. He said the shop he was tending was full of donated items with purchase proceeds going to the charity Oxfam. It was located just next to a mosque. This man warned me about his fellow Moroccans telling me to ignore anyone who approaches me to try and help because they just want money. 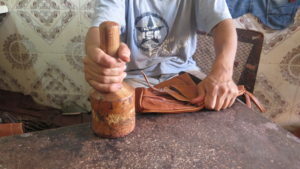 When I left his shop without buying a thing, he strongly urged me to leave a donation. I didn’t and he pleaded, “But I was nice to you.” HA! At times you become drained with constantly having to say no, having to bargain for everything, and almost everyone you encounter wanting something from your wallet. 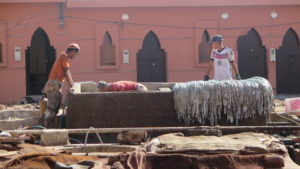 That same day I went to the tanneries, where they convert animal skin into leather by soaking it in concrete pools of liquid. Wow talk about the smell. 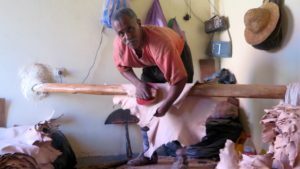 There were animal skins all over the place in different stages of the process. Of course a man insisted on accompanying me as I walked around. 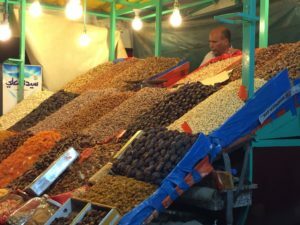 He described the process so I planned to tip him 50 Dirham (just over $5.50), which I felt he earned. Naturally he escorted me to a shop to buy leather – at the time it was the last thing I wanted to purchase after seeing how it was made. The salesman, as most here, was very nice until he understood that I meant what I said when he was told, “I am not buying anything.” I did use his store to get the tip out of my bag and ready for my “guide.” I knew he would be waiting for me out front. It was time to part ways and this is when he demanded 200 Dirham (20 Euros) I just laughed and told him he was crazy. I had 50 Dirham take it or leave it. He then said, “100 Dirham” (10 Euros) I laughed again and walked away but I didn’t get far before he took my original offer. Don’t get me wrong I met and spent time with some wonderful locals but it is all about where and how you meet them. 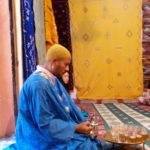 The people who worked and visited the riad were extremely nice folks. 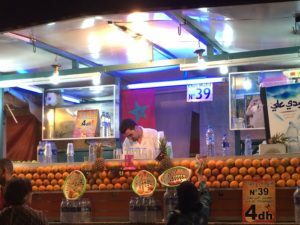 When I was buying Orange Juice (best purchase ever at 4 Dirham, 45 cents a glass) at one of the stands in the middle of the square a Moroccan man asked me to take his picture with his OJ. It turned out he was from Casablanca and he was just visiting. We had a nice conversation then he left. When I went to pay for my juice I was told my new friend had already picked up the tab. Last but not least I had the pleasure of spending 3 days with two young ladies from Marrakech. They joined us tourists on a trip to the Sahara Desert. They were two of the reasons my wall of trust wasn’t completely up. 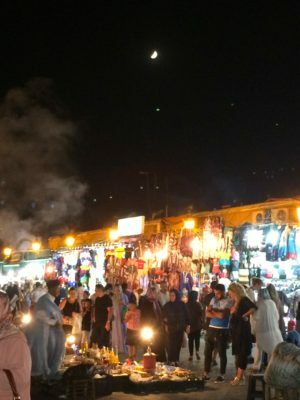 To me there’s something magical about Marrakech, it’s a city that has the power to make you love it even when you want to hate it. 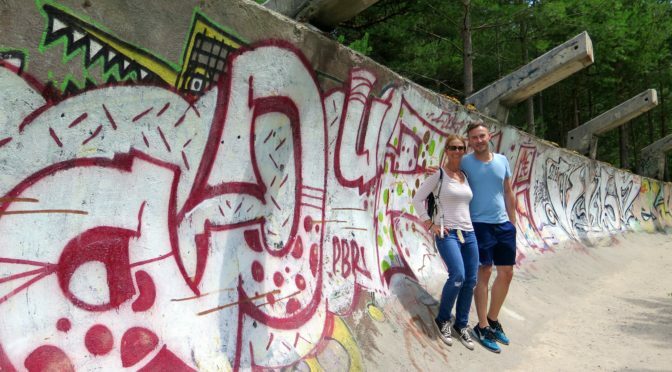 You may recall Sarajevo hosted the ’84 Winter Olympics . One thousand, two hundred and seventy-two athletes from around the world competed for medals in 39 events. 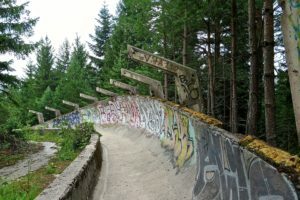 One event was the bobsled and the track used still exists although it is hardly recognizable as a former Olympic venue. 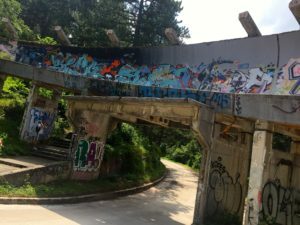 The track is covered with graffiti and at places weeds and moss cover the track. The forest that surrounds this abandon structure is lush greenery. 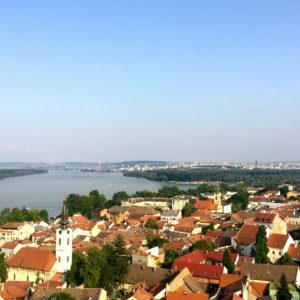 It sits on Trebević Mountain overlooking the city. 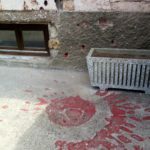 This was the last stop on a “Siege of Sarajevo” tour we took. It was odd to walk down the track and then pose for picture in a spot that has both a proud and a painful place in this country’s history. The track was controlled by Serbian forces during the longest seize of a capital city in modern history. The siege lasted 44 months (1992-1995). Even today all you have to do is look at the buildings around the city and you will see the scars left by bullets and mortars. 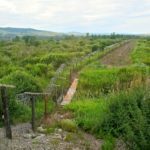 I was aware of Bosnia’s history when I decided to visit but I had no idea that I would find such an appealing country. 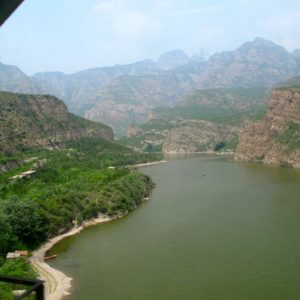 It is so scenic that travel seemed effortless, even long distances by bus. The Neretva River is so incredibly beautiful that just looking at it should top a traveler’s list. It is by far the most stunning river I have ever seen. The color is a rich blue and the rocks and cliffs that surround it only enhance the view. 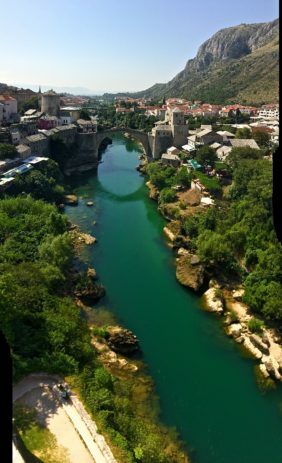 The Neretva is the country’s source of freshwater and I suspect the best place to see it is under the old bridge in Mostar. The charming town of Mostar, yet another reason I fell hard for Bosnia. I wish I spent more time there because I already put it on my short list of places to return. 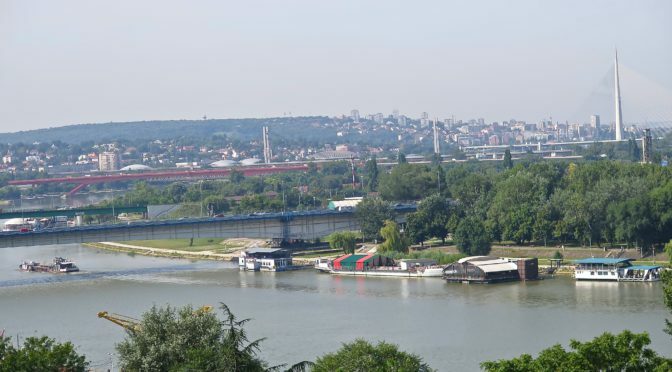 Belgrade is a city I had heard so much about but I have never been and that is why I added it to my summer travel list. When I mentioned to some friends that I was going to Serbia their reaction wasn’t very positive. These were people I met while covering the war in Kosovo. I understood their disdain. I will never forget watching the displaced walk across the border with all their belongings in a plastic bag or two then placed into tents at the crowded & cold refugee camps in Macedonia. Eventually returning to homes that were destroyed and families missing some of their members. The stories were horrific but an entire population cannot and should not be blamed. I don’t know anyone living in Belgrade but before I arrived I was put in touch with a friend of a friend. 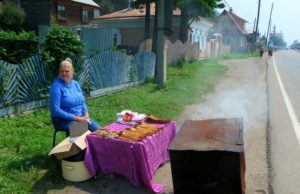 This Serbian woman was so helpful and very eager to offer me advice. She wanted to make sure our visit to her hometown was an enjoyable one. I wasn’t traveling the Balkans alone. I arranged to meet one of my close friends at the airport in Belgrade. We dropped our bags and headed out to catch up over a drink. After wandering around aimlessly a local directed us to the barges on the river. They are floating nightclubs called splavs. This nice fellow gave us the name of the place where he would go if he wasn’t stuck working, Olympic. A band was singing lyrics we couldn’t understand but playing a beat that has us moving with the crowd. We appeared to be the only foreigners in the place but that didn’t seem to matter. It was a Saturday night; everyone was toasting and having a good time. 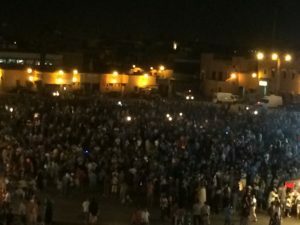 As I looked around at the crowd I thought I could be anywhere in the world. 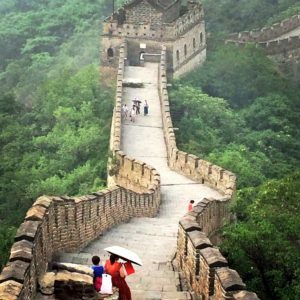 There’s not a place on earth without history that one would like to forget but shouldn’t. Yet time doesn’t stand still and I like to think people learn from the past, as recent as it may be. 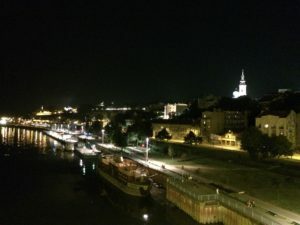 We didn’t spend our entire time enjoying the vibrant Belgrade nightlife we did see some sights in this city where the oldest archaeological artifacts from the area date back to the fifth millennium B.C..
Aside from the restaurants, parks, churches and palaces the Fabergé Museum topped my things to do list in St. Petersburg, Russia. Of course I wanted to see the ultimate Easter Egg. This collection has 9 of the 43 Imperial Easter Eggs that still exists, the jewelry made 50. These Imperial Eggs were original in the private collection of Malcom Forbes and were bought at auction for an undisclosed price but estimates say the costs was at least 100 million dollars. 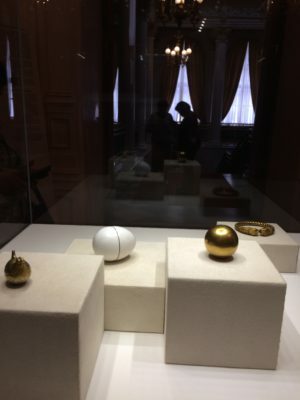 The Armory Museum at the Kremlin in Moscow has 10, the largest collection of Imperial Eggs, but if you include eggs commissioned by the wealthy, the museum in St. Petersburg has the most. 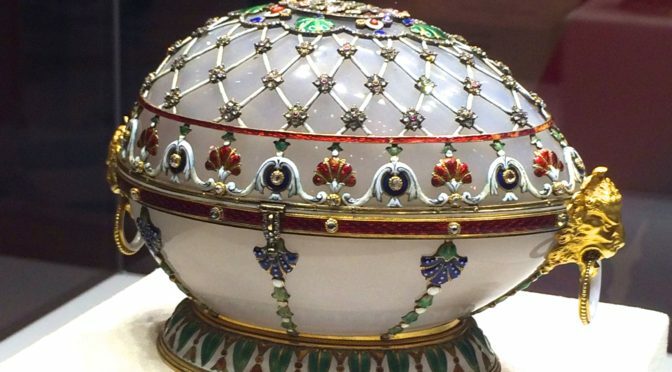 A total of 65 eggs were made by Fabergé. Here the first egg, the “Hen Egg” that was produced in 1885, is on display. 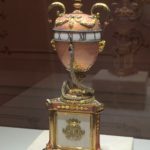 Alexander III gave this egg to the Empress. She was so delighted by the surprise inside, a gold yolk and inside that a gold hen, that this gift started the Easter tradition. 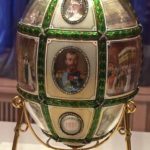 One of my favorite eggs is the 1897 Coronation Egg. The surprise inside is a replica of the eighteenth-century imperial coach that carried Tsarina Alexandra to her coronation. 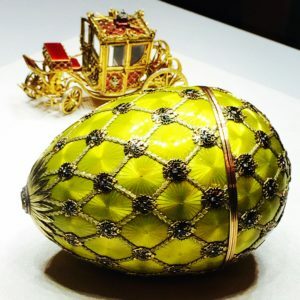 When the original carriage was being restored in 2002 the surprise from this egg was studied to help restores complete their work with precision. 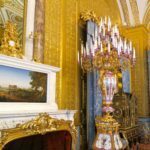 The State Hermitage. As expected the former palace was packed with herds of tourists following their guides but once I started my audio tour I barely noticed they were there. There was so much to see , my attention was constantly divided between the walls in grand rooms and the art that adorn them. 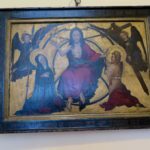 The art collection originated with Catherine the Great and today it is one of the few museums in the world that owns originals by Leonardo da Vinci. Housing 3, 102,917 items, 2 paintings by Leonardo da Vinci’s and the only sculpture by Michel Angelo in Russia, “The Crouching Boy,” are just a few of the highlights. Personally I think this painting by an unknown 15-century artist is worth sharing. The painting of the Last Judgment was gifted to Peter the Great. Paintings like these were commonly hung in town halls. The wooden panel’s fame says, “He who is elected to the council should take care not to lose his soul. May poor and rich, stranger and friend be before him, men he would judge without falling into sin.” A reminder that those doing the judging will one day themselves face ultimate judgment. 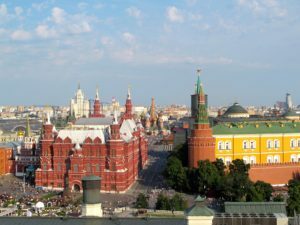 I thought of the Aldous Huxley quote when I was in Moscow, “To travel is to discover that everyone is wrong about other countries.” The city was nothing like I expected. It was vibrant, friendly and energetic. Of course I went to all the known stops on the tourists itinerary. 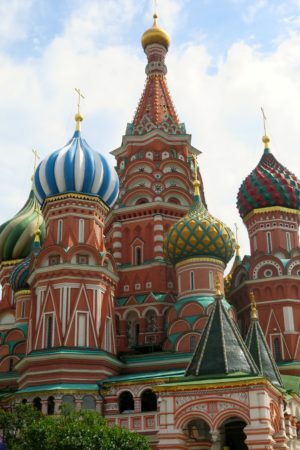 First was Red Square to see Saint Basil’s Cathedral. I could have spent all day standing in the square looking at this stunning piece of architecture. The Cathedral that Ivan the Terrible had built was much more beautiful in person than the pictures I have admired over the years. 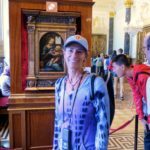 Visits to the museums at the Kremlin, Victory Park and an opera at the Bolshoi Theater are on every tourist’s list and I can now tell you from experience they are worth the time and money. 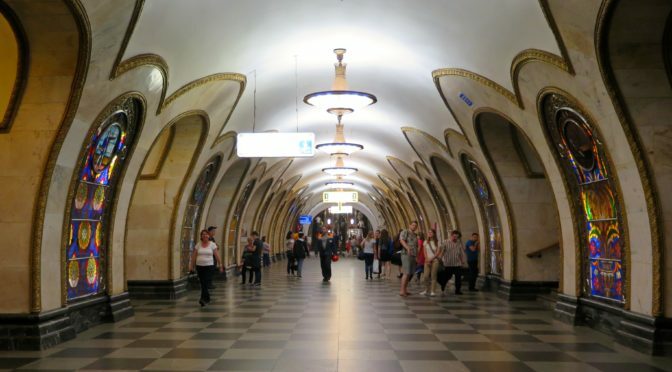 Another highlight for me was the Moscow subway stations. Yes a subway system where there’s granite instead of graffiti. In place of street art there’s imposing marble and mosaics. For less than a dollar I visited 5 stations where each stop felt like its own museum. The station I, as most tourists, spent the most time at was the one closest to Red Square, Ploshchad Revolyutsii. 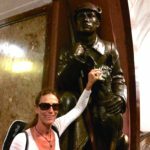 This station has 76 bronze sculptures representing the people of the Soviet Union. One depicts a solider with a dog. The dog’s nose is unmistakably worn. A local girl told me that Russians touch it for good luck and before school exams students will make a trip to this station. My favorite metro stop was Novoslobodskaya. It was built in 1952 and included 32 stained glass panels that can be found between the large marble columns. I thought it was the most beautiful station but according to my research the majority of people give this top billing to Komsomolskaya Station or the Mayakovskaya Station. Komsomolskaya is one of the original subway stations. It was built in 1935 to represent Russia’s fight for independence. 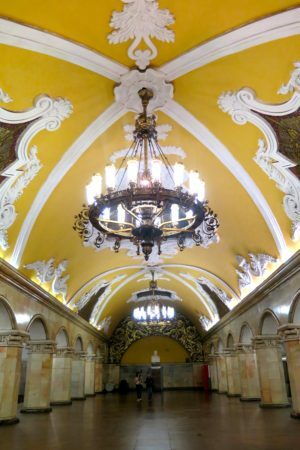 At this stop I found a vaulted ceiling painted yellow, pillars made of limestone and marble, adorned by 8 mosaic panels above the granite floor. As commuters were rushing from train to train at the Mayakovskaya stop my attention was on the ceiling. 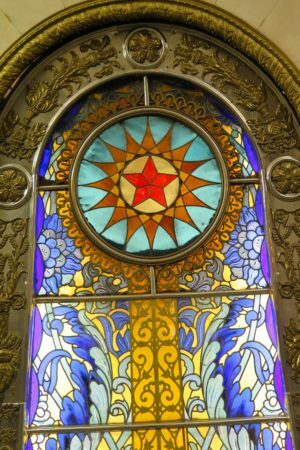 Here you have to look up to see the 34 mosaics that depict an idealist soviet future. 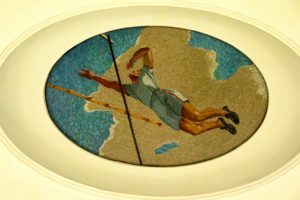 With the Olympic spirit in the air, well maybe not here, but for me I focused my camera lens on the sports themed mosaics. Speaking of the Olympics I still don’t know where I will be to watch the opening ceremony but I do know that tomorrow I am heading to Belgrade, Serbia. What has me really excited about my next stop is the friend I will be meeting there. 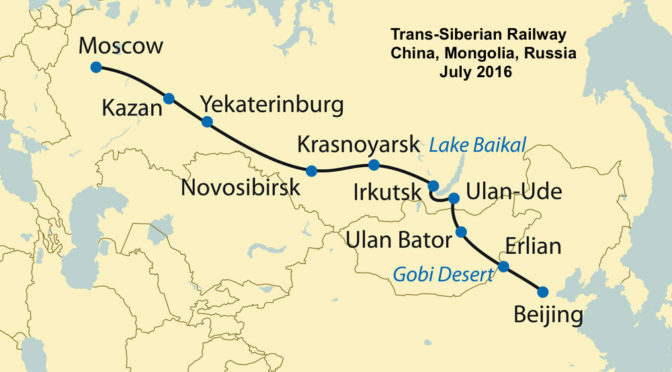 I have one more night sleeping on the rails but technically I can check the Trans-Siberian Railway off my “must do” list. I traveled 4,735 mile (7,621km) by railroad from Beijing, China to Moscow, Russia. 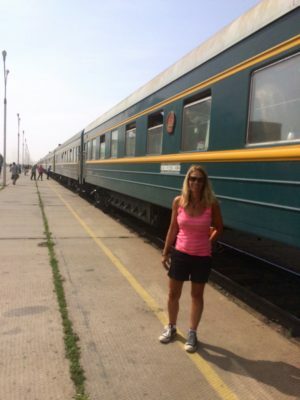 It was actually 3 separate train trips, the Trans-Mongolian, Trans-Siberian and Trans-Ural. 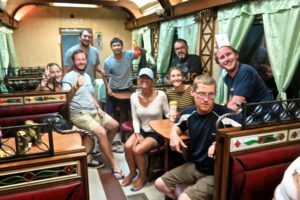 The trip included time spent on a Chinese, Mongolian and Russian operated train. 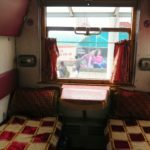 In 2nd class we slept in berths that accommodated 4 people. 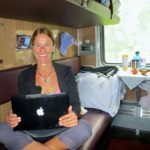 All of the trains had western style toilets, ( on 3 trains the toilets were placed over holes that emptied on the train tracks below) clean sheets and scolding hot water for coffee and noodles. It was if the quality of the trains increased the farther west we traveled . The Chinese train was hot but the windows opened and there was a fan in each sleeper. 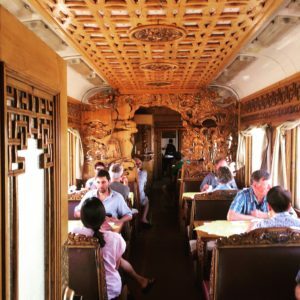 The Mongolian train was older but it had a beautiful dining cart decorated with carved wood. The windows on the Russian trains don’t open. But they were air-conditioner. 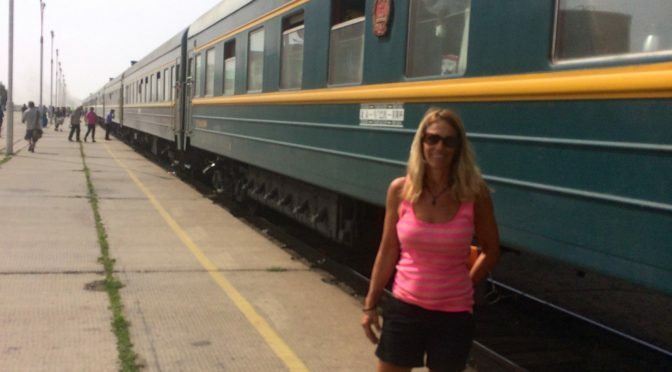 The first Russian train was the only time I didn’t have to use baby wipes to shower before going to bed. I was able to take a shower. (Under these circumstances I am referring to a metal bucket of steaming hot water and a scooper made from the bottom part of a plastic water bottle as a shower.) 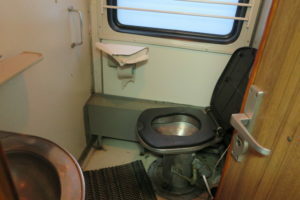 The train going to Moscow was new with all the modern amenities and the service was first class. The experiences aboard the trains were interesting but the real highlight was watching the landscape change from my seat by the window. Unfortunately my final train trip will consist of a room without a view; the Moscow to St. Petersburg rail is overnight. 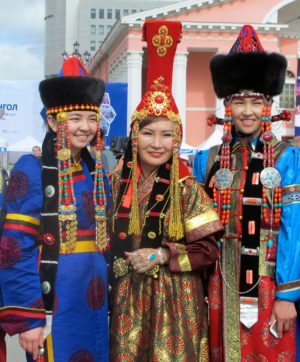 Leaving Mongolia was difficult, not only because I wanted to spend more time there but also because the border crossing into Russia took about 6 hours. The only real hardship was not being able to use the loo. Whenever the train pulls into a station the bathrooms, which have a western style toilet over the hole in the floor, are locked. Anticipating this my morning coffee wasn’t consumed until the afternoon when we were on the move again. 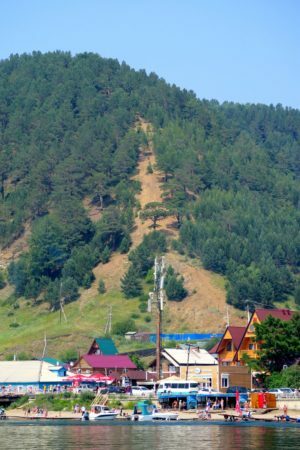 The destination was the shore of Lake Baikal, also known as “The Pearl of Siberia,” where I would spend the night. 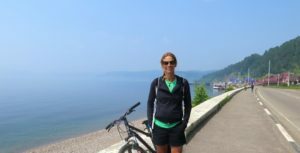 Lake Baikal is not only the deepest lake in the world (5,714 feet) but it is the largest freshwater lake in Europe and Asia. 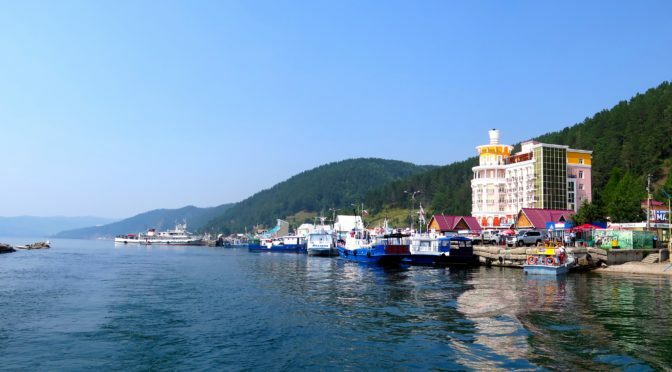 Upon arrival the group I am traveling with (an awesome collection of people) went to eat the local smoked fish while I rented a bicycle and took a spin around this quaint southern Siberian town. 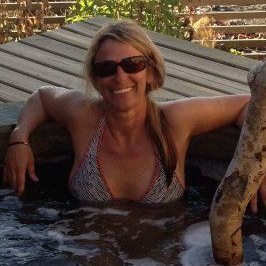 Although it was a warm day and the sun was shining but at 6 degrees celsius ( 42F) my foot is the only part of my body that made it into the clear calm water. As I sat on the pebbled beach every so often there would be a ripple in the water and I could spot the head of a seal emerge to take a breath. The night at the lake ended with a visit to a man named Nicholi’s home for a banya. (Russian sauna) An experience that was… well I think the word interesting will have to do to describe it. The next stop will be Yekaterinburg, Russian. 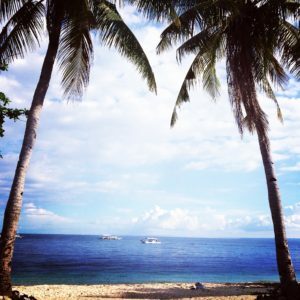 It is just a 48-hour train ride away.